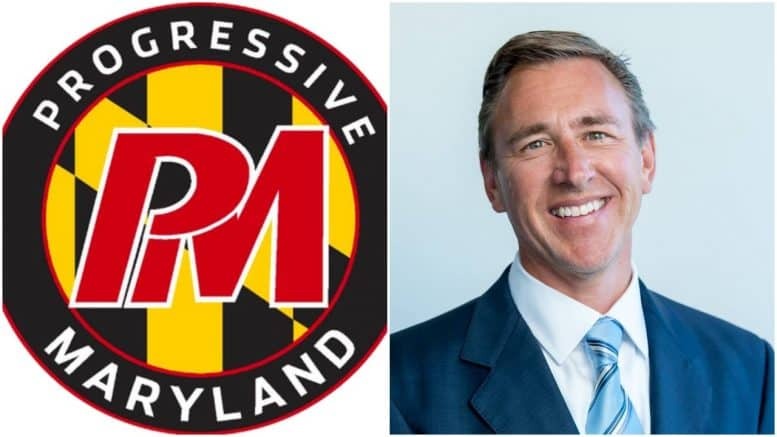 The left-wing activist group Progressive Maryland says it has raised $110K to date in its campaign to target Montgomery County executive candidate David Blair. The group’s executive director, Larry Stafford, told A Miner Detail on Saturday that it has raised “around $110K so far” to run a negative campaign against Blair’s business record while also highlighting that Blair is a former registered Republican. “And we’re getting set up to do online fundraising with our members this week on act blue. We’re at a nice pace though wish I had more time to make calls. Some affiliates are more anti-Blair some are just pro-Elrich,” Stafford said. Blair, a progressive, successful businessman from Potomac, is a first-time candidate for public office. He sold his pharmacy benefits management company, Catalyst Health Solutions, in 2012 and has been involved in other business adventures since the sale. Progressive Maryland first began its coordinated attack on Blair last month when it distributed a flyer that lists a few unsubstantiated digs at Blair’s business record. The flyer claims that “David Blair is not one of us!” and claims he is trying to buy the election. Blair is largely self-funding his campaign and is also accepting donations. The flyer that Progressive Maryland is distributing includes an authority line at the bottom with the name Progressive Maryland Liberation Alliance PAC. A Miner Detail reported last month that Progressive Maryland formed a Maryland super PAC in March to raise money to support and oppose political candidates. Asked about the flyer last month in a phone interview, Stafford told A Miner Detail he wasn’t sure who created it and said he will list the flyer as an in-kind contribution in an upcoming campaign finance report. “I just have to find out who put it together. We’ve had an in-kind contribution in terms of a flyer,” Stafford said. The super PAC’s latest campaign finance report shows a $50,000 donation from Caitlin Heising, a San Francisco-based philanthropy consultant. Heising is the granddaughter to billionaire retired hedge fund manager James Simons. Stafford, though, told A Miner Detail that Heising’s $50K donation will not be used to target David Blair but instead will be reserved for Progressive Maryland’s work on criminal justice reform in Baltimore. “I spoke with Caitlin. She is an ally and friend. We know her through her national work and national network around criminal justice reform, and she’s a big supporter of racial justice work. So, again, she has absolutely zero to do with David Blair stuff. I mean, the report will show, eventually, that is not what she was donating towards,” Stafford told A Miner Detail. When A Miner Detail spoke with Stafford two weeks ago, he said Progressive Maryland had not raised any money yet to target David Blair, and he was emphatic about Heising’s contribution not being used in its anti-David Blair campaign. “We have not spent any money on a David Blair effort yet. We have not raised any money on a David Blair effort yet. What you will soon see on our report is that we are raising money for this effort in Montgomery County. And then you can talk about that. If you’re trying to insinuate that she’s funding an effort against Blair, that’s not true,” Stafford said. Blair also pushed back against the coordinated attacks in a Friday interview with A Miner Detail radio podcast host Ryan Miner. A Miner Detail’s interview with Blair will be released later this week. Progressive Maryland has endorsed Montgomery County Councilman Marc Elrich, who is considered one of Blair’s leading opponents in the Montgomery County executive race. Several Progressive Maryland staffers are actively aiding Elrich’s campaign, but Stafford denied that the Elrich campaign is coordinating efforts in tandem with the Progressive Maryland super PAC targeting Blair. “I don’t even know Marc all that well. I just know his record. We, of course, have endorsed Marc. You can’t buy Montgomery Coalition is coming about as a result of what David Blair is doing. We want to give a contrast to what he’s putting out there and talk about his real record, his business background, whatever. And there will be plenty to report on. It will be an action-packed effort to make sure voters in Montgomery County are informed,” Stafford told A Miner Detail. Progressive Maryland is affiliated with a number of employee unions and is a mechanism for labor unions to give money to candidates. The statewide political organization supports a number of progressive issues, including getting big money of politics.